capturing and containing all heat and smoke generated by cooking appliances. The EMS is available in three different phase configurations and various sizes. Operation of the Energy Management System (EMS) is based on a modulating principle where the fans modulate based on the duct sensor temperature reading. A ductmounted temperature switch constantly monitors exhaust air temperature and forces the system to adjust speed thus saving energy in idle mode. Low speed is factory set to reduce airflow by 20%. For extended heavy cooking timeframes, a 100% airflow override option and adjustable timer (factory set at 30 minutes) are supplied. The EMS is available in three different phase configurations and various sizes. 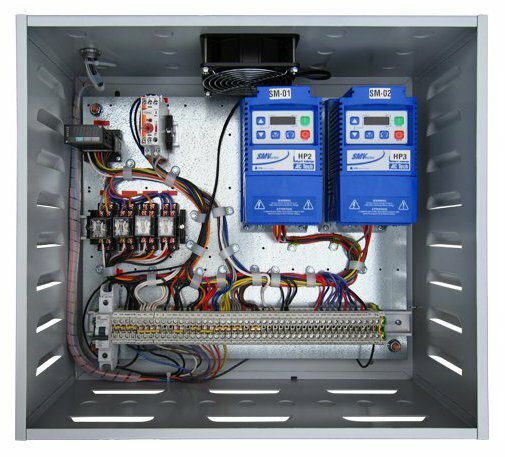 All panels include adjustable variable frequency drives to adjust the high-speed set point and lowspeed set point. The panels include color-coded wiring / wiring diagrams and spare terminals controlled by the fire system micro switch. Units are factory pre-wired to shut down supply fans in a fire condition. A factory pre-wire option is available to turn on the exhaust fans also in a fire condition (if required). Panel is ETL-Listed to US and Canadian Standards for installation in the integral ETL-Listed Utility Cabinet. Control Interface The control interface shall include one fan switch, one hood light switch, one 100% airflow override push button and indicator lights. Indicator lights shall include a “power” light, a “fans on” light, and a “100% airflow override” light. The control interface shall be screen-printed on stainless steel and have capability for installation on the face of the hood, face of the utility cabinet, or on the face of the control enclosure. Enclosure The control enclosure shall be NEMA 1 rated and listed for installation inside the exhaust hood utility cabinet. The control enclosure may be constructed of stainless steel or painted steel. Variable Frequency Drives Variable frequency drives shall allow full adjustment of high-speed and low-speed airflow for proper kitchen balance. Drives shall contain motor thermal overload protection and control inputs for up to seven preset speeds. Acceleration and deceleration times shall be fully adjustable as well as fan speed at each of the seven different inputs. Drives shall also allow for a minimum and maximum frequency set-point. Temperature Switch Adjustable temperature switch shall be mounted in the exhaust hood riser. Temperature probe shall be constructed of stainless steel. Temperature switch shall be factory set at 130º F for 600ºF cooking appliances and 90ºF for 400ºF cooking appliances. The temperature switch is fully modulating. Timer Timer shall contain one instantaneous contact and one delayed contact. Time shall be adjustable from.05 seconds to 30 days. Timer is energized with 100% airflow override button. When button is depressed, time starts and fan goes to high-speed. Upon timeout, fans return to low-speed or speed dictated by temperature switch. Wiring & Terminal Blocks The panels include color-coded wiring with as-built wiring diagrams and spare terminals controlled by the fire system micro switch. Factory pre-wired to shut down fans in a fire condition. Factory pre-wire option to turn on the exhaust fans in a fire condition (if required).